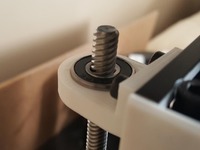 Universal Ultimaker 2(+) Spool Holder by Undeviljur is licensed under the Creative Commons - Attribution - Non-Commercial - Share Alike license. This is a universal Spool Holder for the Ultimaker 2(+) and is easy detachable while holding a spool. This makes it easy for people who don't have good access to the back of their printer. The Spool Holder can hold spools with an inside diameter from 39mm up to 70mm and a maximum width between 95mm and 125mm (depending on the inside diameter). The tread used to clamp the spool is a multi pitch thread (multiple starts, like a jar of jam) so the travel per revolution is 3 times as much. This makes putting on the nut easier and you don't have to make as much revolutions to clamp the spool. Make one of every part except for the "Plastic Bearing" you need to of those. M8 threaded rod 150mm long. 2x M8 nuts to assemble. If possible I recommend Tread locker (LOCTITE) on the nuts. Changelog Update V2: I made the tolerances bigger so there should be no more problems with parts that don't fit. I also improved the strength of the Threaded Cone V2 so it wont brake when you tighten the treads hard. This resulted in an increase of the minimum inside spool-diameter that can fit (was 33 now is 39). In the "Files V1 (old model).zip" you can find the files before the update. I used the Low friction spool holder by Sneakypoo as inspiration. The Solidworks and step files are also available. I used Cura 2.5.0 to slice. I printed everything in PLA, the tolerances in this model don't work with ABS. 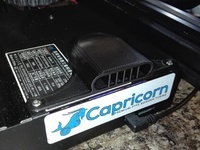 Speed 60mm/s for all parts except for ''Long Tube'' and ''Short Tube'' use 30mm/s for those. Print all parts in the the original orientation. 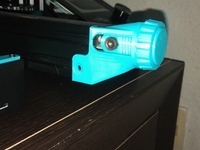 Use support for the part ''Printer mount''. 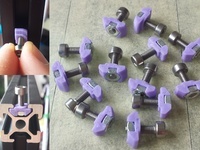 It is also recommended to print the parts: "Printer mount" and "T-piece" with 100% infill. When you use very heavy spools this is NECESSARY. You can also use my .gcode files. Say thanks by giving Undeviljur a tip and help them continue to share amazing Things with the Thingiverse community. Say thanks and help Undeviljur continue to share amazing Things with the Thingiverse community. You'll need a PayPal account to tip Undeviljur. Click the button below and you will be redirected to PayPal. Once the payment is complete, you'll be brought back to Thingiverse.